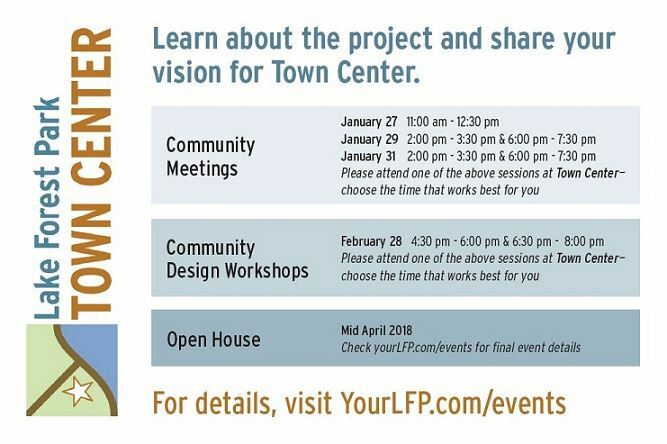 Come talk about Town Center! The City of Lake Forest Park has made important changes in the way they are approaching the Town Center Vision. They have narrowed the project's geographic scope and put a much greater emphasis on public engagement. They have set up a series of public meetings, hoping to hear opinions on concepts and design ideas for Town Center from a wide cross-section of Lake Forest Park residents and businesses. In addition, they have set up a webpage just for information about the current major projects: Your LFP. This new website will serve as the primary resource for information about major projects, including contact information, project updates, upcoming events, event materials, and other relevant documents.